Sift together flour, mixed spice, salt in a large bowl. cut the butter into cubes and add it to the bowl. rub all the items together with your fingertips until the mixture looks like breadcrumbs, add sugar and yeast. Beat egg with 1/4 cup milk and pour this to the flour. mix well with a wooden spoon. sprinkle some flour onto a clean surface, knead well with your hands for five minutes and transfer to a greased bowl. Cover the bowl with plastic wrap. leave it in a warm place for one hour, until the dough has risen. Turn the dough out of the bowl and sprinkle the dried fruit over it. knead the fruit into the dough until it is mixed in. Put the dough in the tin and cover tin with plastic wrap. put it in warm place for about 45 minutes to rise little more. pre-heat your oven to 180 degree c, brush the top of the dough with milk, bake the bread for 10-15 minutes or till done. push the skewer into the loaf. If it comes out clean, the loaf is cooked. Transfer the bread on a wire rack to cool. decorate with cherries. Looks colourful and kids favorite too.. Soft n moist, perfect!! Hope u'll visit my space and follow it too!! That looks soo fluffy and soft! 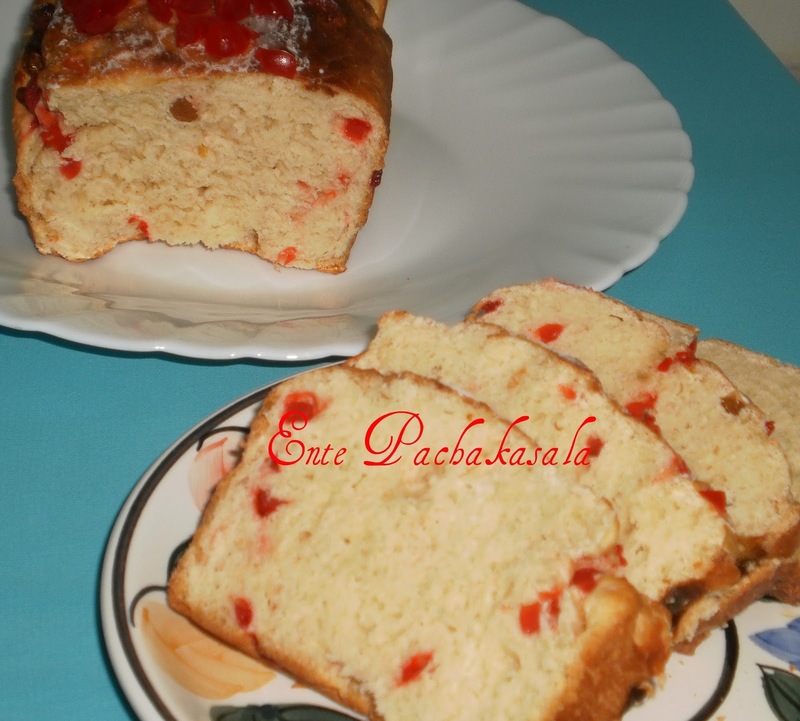 yummy fruity bread, used to have these during school days..bookmarked it..
that looks soo very delicious! The fruit cake looks delicous.. I must try thsi recipe. 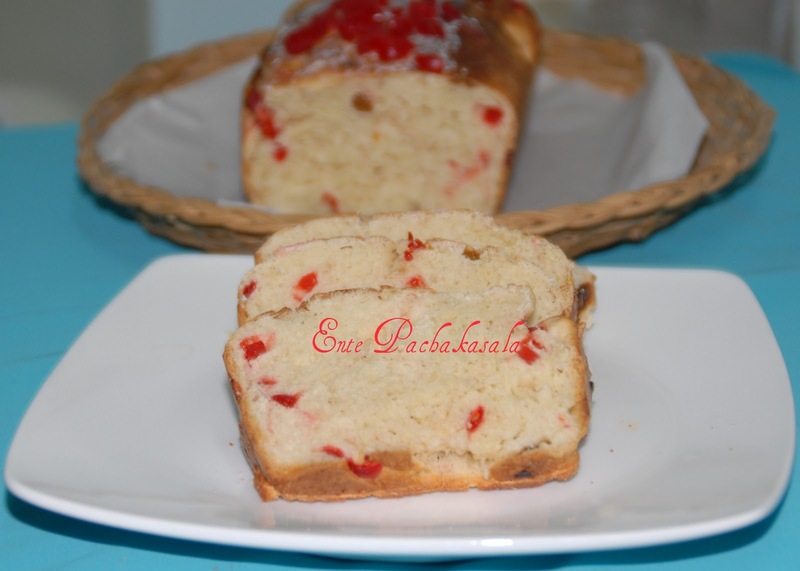 Fruit breads are always yummy...perfect with a cup of tea. you know, when i was little..I used to LOVE this. dad always used to buy this for us. Thanks for sharing the recipe. 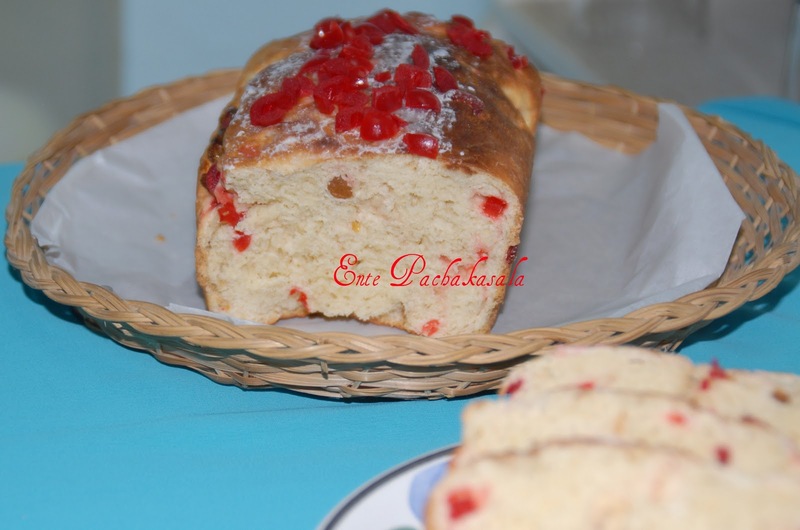 Adipoli fruit bread, chaya koode kitiyal mathi.